Because the market contracted and stopped buying the "others"? I should note that Apple sold less than over 3 million units YoY, or over 22% less from 2017, despite Single's Day, Christmas, and the first quarter of new models, iPhone XR, XS and XS Max, which is supposedly the best buying season of the year. Next successive quarters these new models become less new. Its like a movie, you get the best sales out of the gate, and then goes lower as time goes on. This means that iPhone sales are going to get lower from this point, unless Apple has to eat the bullet and start cutting prices drastically. Furthermore, new models are coming out from the Chinese field, including the much rumored Huawei P30, the Xiaomi folding phone, and the recently shown Meizu Zero. I also wonder what happened to Xiaomi to have also lost so much sales YoY. The US has already shot itself on the foot somewhere when it comes to the availability of the best tech products. Despite being the birthplace of Apple and Android, the smartphone market in the US feels like backwater and boring compared to the rest of the world, especially in China, Japan, Southeast Asia, India, and the best mobile tech hubs in the world, Hong Kong and Singapore. The selection of phones in the US is absolutely so boring, namely a choice between rotten Apples and Samsuck. Once in a while, you have a ray of light coming from OnePlus and the recent Pocophone F1, the OnePlus 6 and the Poco F1 made a big splash with phone enthusiasts in 2018, while you wonder WTF happened to Google's design talent when they came out with the Pixel 3. Now you can blame two things to that. The first is the nature of the US carrier industry, and the carrier contracts that locks in a market. There is no true free market here, and honest to goodness market competition between product design and affordability. The second is worst --- the US patent troll industry --- where paper companies sue tech companies over dubious patents, and a highly questionable and oddball compared to the rest of the world, US court system that upholds these patent trolls. These patents could not stand a chance outside of the US as we have seen with many cases. The patent troll industry literally puts a tax on each phone sold in the US, making them cost higher than they should go for, at the expense of the American consumer. Then you go on to other things. The US telecom industry isn't the best in the world for its contract prices, its mobile connection speeds, and in terms of coverage. Not the best, not the worst but somehow in the middle of the world with so many countries ahead of it, even Peru. Like hell, Mexico has a faster mobile connection speed than the US. Not saying China is off the hook, as China is still among the worst when it comes to the Internet but this is due to the Great Firewall, but most importantly, the sheer density and population of China that makes mobile Internet improvement a constantly moving target and a great technological challenge. AssassinsMace, advill, bluewater2012 and 2 others like this. Apple doesn't make telecon equipment like Huawei. Its those communication center, data center, base station etc, US go after. Also Apple are assemble in China, if china go after apple, it will hurt chinese worker too. the phone market doesn't make much profit anymore, which is why Samsung are concentrate on various semicondutors. Apple revenue are from mostly iphone. More US gov't interferes more China will move towards indigenous everything. If they wanted to keep China dependent they shoulda continued what they were doing and make Chiense people love them more. Much easier than trying to take down a nation of 1.4 billion people by telling them they're evil and have no place in the world. taxiya, bluewater2012, N00813 and 2 others like this. Observe western propaganda in action. 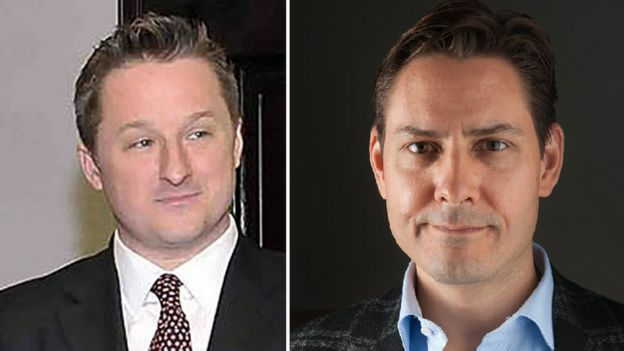 Image captionCanadian nationals Michael Spavor (left) and Michael Kovrig have been put under "compulsory measures"
Earlier this month, a Canadian man was sentenced to death in Chinaafter a court said a jail term of 15 years was too lenient. Noticed how the BBC effectively censored the ambassador’s words by summarising it as merely suggesting the American case was seriously flawed. That’s the heart and soul of the story, and they summed it up in one sentence and rapidly moved on. You can bet that had someone said something bad about China, the BBC would quote every last word said, repeatedly. Noticed how they inserted the first link to the Canadian claim that the case was not politically motivated. And capped it all of with the case of the arrested Canadians to all but explicitly say the Chinese cases are politically motivated. This is how the western MSM censors the news and propagate its propaganda - not by outright censoring the news, but by selecting the emphasis on what POV they allow to be told. taxiya, AssassinsMace, Lnk111229 and 10 others like this. 100% agrees. This was what I was saying a few post back. This is how the west propoganda machine works. It's never to ban things immediately. It's simply mis-information, part quotes, mis-quotes and last resorts lies. I mean the BBC is a great example. Whenever the BBC quotes reports from other countries media the British government don't agree with. It always say thinks like "state media. Government mouthpiece" look at the example of the recent Saudi case. They got treated with kids glove. If that was China. They would have thrown the kitchen sink at it. Another thing is when BBC quotes "state media, government mouthpiece". It does it without any sense irony. I mean, come on! What dies BBC stand for? British broadcasting cooperation. Paid for by the British taxpayer with appointments by the British government. If that's not the monthpiece of a state media, I don't know what is! But, of course they keep repeating to their audience how impartial they are. Almost everyday they repeat this. So as the old saying goes. " if a lie gets repeated many times........ you know the rest"
if this ambassador thing was the other way round, and China sack their ambassador. The westen MSM will go overtime in demonising China as authoterian state hell bend on clamping down freedom, descent and liberty. With photos of the 4th June incident thrown in. And to milk it out as long as possibe. They will get the nobel prize committee readied the Nobel prize for the ambassador in a few years time! taxiya, bluewater2012, plawolf and 4 others like this. Problem is no US or it's allies will trust china telecommunications completely . it's like asking the like of Cisco to build core telecommunications network in China . The smartphones phones don't have profit s as before. US already considered china as it's near peer rival. Then it is basically a stalemate. US can’t offer the tech itself but it is also unacceptable to buy it. Usually in such a situation you’d just try to be more positive with the other country and double check whatever they send over, that’s what China did itself on some things during the 80s. The global banking system also gives America an advantage. Lenders have been hit hard by American prosecutors, notably BNP Paribas, a French lender walloped in 2014 with an $8.9bn fine for facilitating trade with Sudan, Cuba and Iran. Deutsche Bank was fined $425m in 2017 for helping launder $10bn from Russia. No surprise that most banks would sooner denounce a dodgy client to America’s authorities than keep doing business with them. Along with companies, some banks have had to agree to “monitors”—independent observers paid for by the firm but reporting to American authorities—as a condition of avoiding prosecution. According to the Wall Street Journal, it was one such monitor at HSBC (which agreed to monitoring after being fined $1.9bn in 2012 for allowing Mexican drug cartels to launder money through its systems) who notified American prosecutors of suspicious transactions at Huawei. 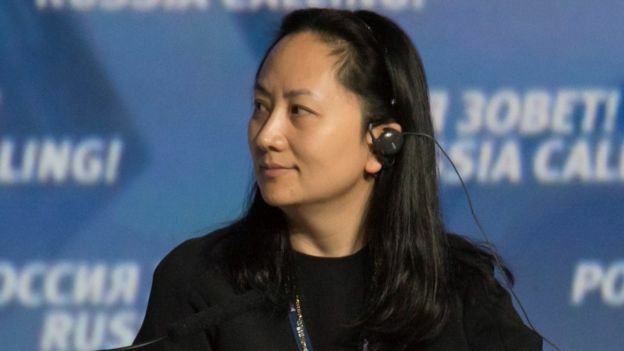 It is the charge that she may have tricked banks into, in effect, busting sanctions, which Huawei denies, that seems to be dogging Ms Meng. 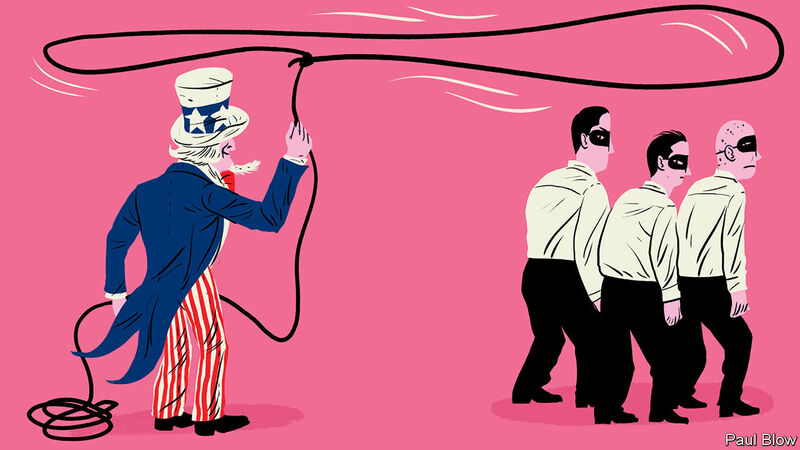 It seems plain to foreign critics that America disproportionately targets foreign companies. Over three-quarters of the $25bn it has exacted in fines for money-laundering, sanctions-busting and related offences has been against European banks, 15 of which have paid over $100m each, according to Fenergo, a consultancy. American banks have been fined less than $5bn over such misdeeds (though they have been clobbered for other transgressions, such as fraud connected with subprime mortgages). Anti-corruption probes also fall disproportionately on foreign firms. 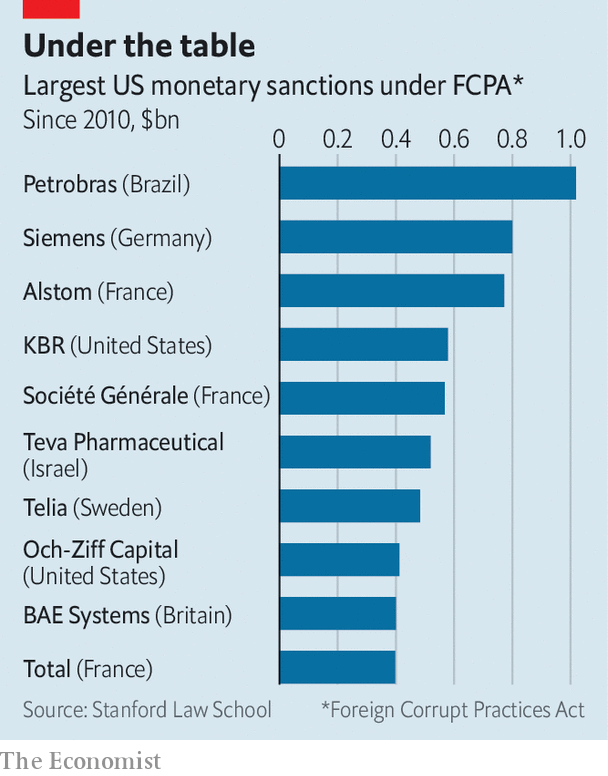 Of the ten biggest FCPA fines, only two have fallen on American companies (see table).